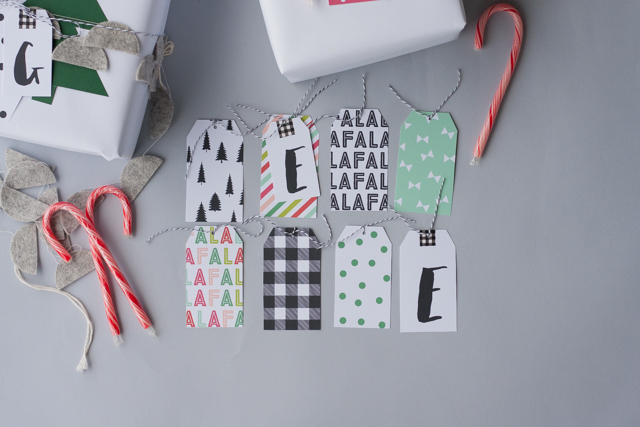 TAGS – I made some hand lettered monogrammed tags and patterned tags in bright colors or black and white to use alone or layer together. Click the links below to download and be sure to share with friends or pin for safe keeping! 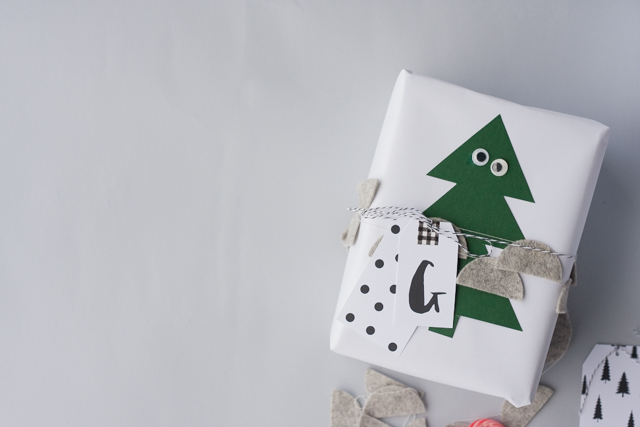 TOPPERS – A little bit of texture is always nice, even when wrapping packages. 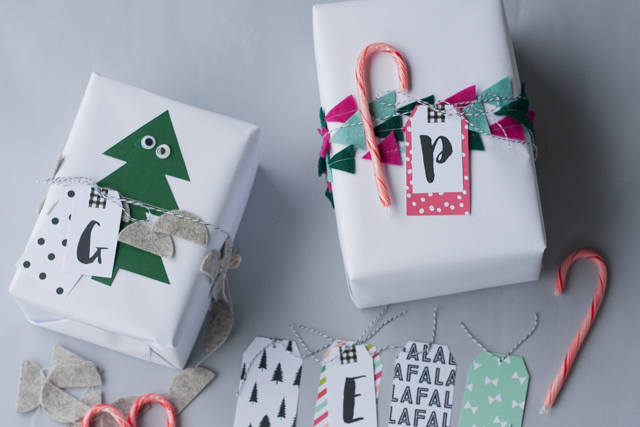 Lately we’ve been tying a pom-pom or these charms to gifts the kids take to Bday parties but for Christmas I thought it would be fun to wrap boxes with felt garland as a sort of ribbon and topper in one and then embellish with paper shapes the kids cutout. GARLAND – a few from Land of Nod 1/2/3/4/5 (lots of options on etsy too!) or DIY by cutting shapes from felt and sewing together by hand or machine. 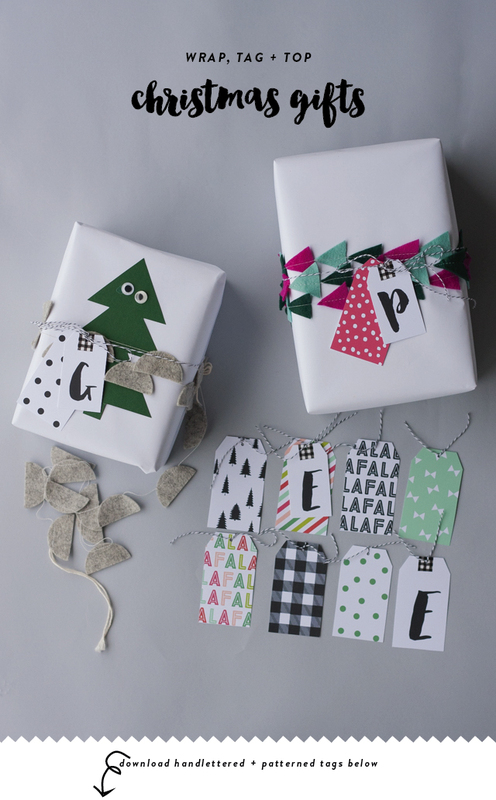 PAPER SNOWFLAKES – make cute toppers and keep little hands busy and creating for awhile! WRAPPING – This year I’m wrapping all of our gifts in white. Assuming I don’t runout of course. With all the craziness of the season it’s nice to have something consistent that does with everything! TWINE – I have several large spools of twine that i use for just about everything that can be purchased for next to nothing in several different colors at THIS coffee supply store. Find a friend or two to order with and split shipping and, or spools and get a little bit of everything! SMALL BAGS (perfect for stocking stuffers + treats!) – Whisker Graphics has lots of cute stuff but I recently discovered a beautiful assortment at Paper Mart for less money (glassine lined/patterned paper/treat bags). Some bags are listed per 2000 unit case in which case look for the “smaller quantity” tab. They also have washi tape if you are in the market! Back to shopping, gifting and itsums – We are giving 4 gifts again this year (a need, a want and something to wear and something to read) and I’ve been using itsums to keep track of it all. Because of the 4 gifts my boards are pretty simple but you can click to check them out for GRIFFIN/TILLY/POPPY. Hope you are enjoying the most wonderful time of year! Yay, thank you for sharing these! !